The Vietnam Fine Arts Association held a ceremony in Hanoi on September 14 to present Vietnam Fine Arts Association Awards and the 2016 “For the Cause of the Fine Arts in Vietnam” medals to the recipients. The Vietnam Fine Arts Association Awards 2018 were presented to five outstanding works of fine art, including one first prize, one second prize and three third prizes. According to the artist Tran Khanh Chuong, President of the Vietnam Fine Arts Association, this year’s awards received more than 2,400 submissions from artists across the country. The organising board selected more than 1,300 works from nine exhibitions in provinces and cities across Vietnam, he added. Arts councils at the fine art exhibitions honoured 90 outstanding works from the nine areas, including three A prizes, fifteen B prizes, nineteen C prizes, and fifty-three consolation prizes. In addition, one B prize and one C prize were presented for Fine Art Criticism. For the first time, the Fine Art Criticism branch’s book "70 years of the Vietnam Fine Arts Association (1945 - 2015)" won the first prize of the Vietnam Fine Arts Association. The book collects essays from the 70th Vietnam Fine Art Conference and previous workshops. The book allows readers to review 70 years of Vietnam’s fine arts. 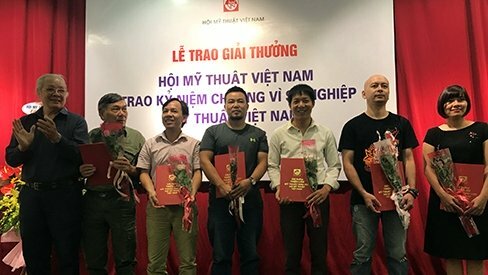 On the occasion of the event, the 2018 “For the Cause of the Fine Arts in Vietnam” medals were presented to eight individuals for their contributions to fine arts in Vietnam.